Each year we carefully select Fellows to join our Fellowship Events. We look for those who hold the same values and beliefs as the DeBoer Fellowship for personal development and for serving the community. The 2017 Fellowship Year was the another year with wonderful people who were willing to learn, thrive for their personal growth as well as for community development. At the 2017 DeBoer Fellowship Graduation, we acknowledged excellent Fellows and gave the Jack & Marilyn DeBoer Award. The award is given to the fellow who most embodies the DeBoer Fellowship values of excellence, service, respect, collaboration and growth. This year it was given to Ei Ei Aung who strongly embodies the DeBoer Fellowship values in her life. Throughout the Fellow Events, Ei Ei modeled teamwork, encouraged others to be involved in different activities and helped them to succeed. Ei Ei was well respected by her colleagues as well. She also played a good example of someone who understands her passion and acts it out. Ei Ei has a heart for elderly people in Myanmar and she always want to help the elders in need and show them her companionship. 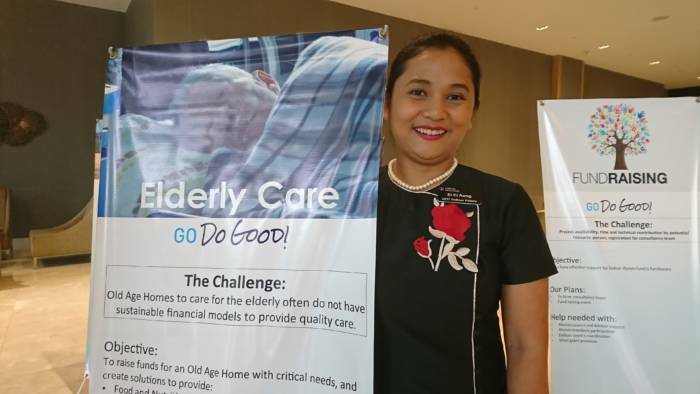 She now helps several elderly homes in Yangon and provides financial support. She also challenges others to share their love, their care and to bless their elders. Ei Ei Aung is from Yangon and works as a Customer Care Senior Staff in MPT Mobile Telecommunication. She has continued her involvement in the DeBoer Fellowship after graduating as a member of the 2018 Alumni Council. She’s soundlly deserved to be awarded. I do believe her passion and dedicated behavior to do more for the elderly in her future life. Congratulations Ei and also Jack and Marilyn to reward this grand prize to her and so encourage for younger generations of Myanmar. Thank you uncle win thu. Yeah, you desreve the award, Ei. Much appreciation to your all hard works during 2017 events and all that will be coming in the furture. Thank you Ko Naw Mai. Please keeps such kind of passion and strongly embodies for future!